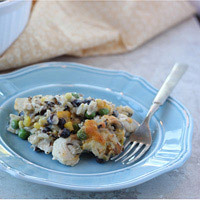 A cheesy, chicken-and-rice-filled casserole. Serve with a green salad for a delicious dinner. Cook rice according to package directions, discarding spice packet. Spray medium skillet with cooking spray; heat over medium heat until hot. Add onion, green and red pepper, mushrooms, and Italian seasoning; cook, covered and over medium heat until mushrooms are tender, about 5 minutes. Cook, uncovered and until vegetables are tender and excess moisture is gone, 5 to 8 minutes. Combine rice, mushroom mixture, chicken, beans, corn, peas, sour cream, and 1 cup cheese; season to taste with salt and pepper. Spoon into 2-quart casserole; sprinkle with remaining 1/2 cup cheese. Bake, uncovered at 350° F until hot through, about 30 minutes.